This morning I woke up with a decimated throat, a valve in my nose stuck in the “full on” position and joints feeling twice their age. It’s a Sick Day. This gives me opportunity to stay in bed, knit, catch up on email and Reader sites, and make a blog entry or two in between blowing my nose and trips to the bathroom. Speaking of bathrooms, In several of the homesteading books and websites I’ve been reading through, they have diagrams for setting up several elaborate grey water reclamation systems – systems that will recover the non-sewage water from showers, sinks, dishwaters, et cetera – for re-use in non-potable applications, such as recycling it for flushing the toilet. They’re pretty neat, although not simple to set up in an existing home. I’m intrigued by them, for sure, but it’s not in our budget right now. For the last 10 years or so, in my effort to reduce water consumption, I generally don’t flush urine only bathroom trips. Remember the old saying, “If it’s yellow, it’s mellow?” Right. And yes, I’m one of those people who pees in the shower; I’ve never quite wrapped my head around why some folks get grossed out about this. It’s the shower; I’m about to clean myself head to toe! The urine gets rinsed right down, too, and the tub gets cleaned out once a week. Ah well, different strokes. Moving in with Mike Neir, however, has thrown a bit of a monkey wrench with the former, though; leaving unflushed urine in the toilet offends Mike Neir’s sensibilities. 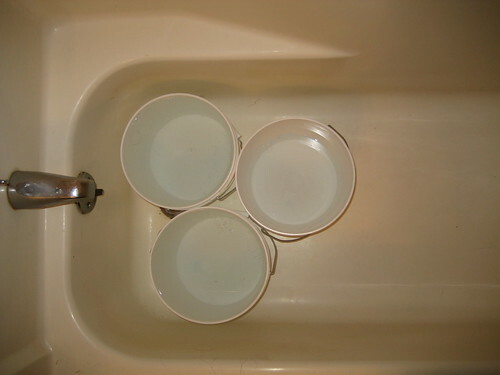 However, he came up with another plan to help save water: three 2-gallon buckets in my shower. When I take a bath (which is only about once or twice a week these days, due to water guilt,) I fill them up before I drain the tub. When showering, I simply leave them in there with me. This has introduced a whole new dimension to my showering experience. First, there is the video game aspect – trying to see how much water I can get into the buckets when rinsing my hair, how much I can direct from body run-off, et cetera. Oh, it’s big fun – and it probably results in my playing in the shower a bit longer than strictly necessary. Second, and of more direct interest (to me, anyhow,) is the clear and present tripping hazard, which was heretofore completely absent. An air of danger helps to keep one on one’s toes, gets the heart pumping, sends one clutching for the (rusted-out) grab rail in a moment of panic. Still, though, I can get about 7 flushes out of those three buckets after a bath, and 2 to 4 after a shower, so it was a good idea – it’s just not as convenient as simply not flushing the toilets. I’ll keep at it, though. This stuff is important, and small things do add up. Next up, looking for ways to better winterize the house that don’t involve flimsy plastic films and hair dryers.